Where Does Storytelling Fit Into Your Marketing Activity? Have you ever told your audience why you came up with the idea for your business? People DO want to hear the story behind your brand, your business, your flagship product, and your newest service. Storytelling is one of the oldest and most natural ways for us to share ideas and make sense of the world. And, these days, consumers care more about the stories behind the businesses they trust. Your story builds connections, fosters trust, and nurtures relationships. The more people know about your brand story, the more they will feel invested in you – and loyal to you. Emotional connection matters – perhaps even more than customer satisfaction. Clients and consumers will forgive a great deal if they like you. That’s not to say that you shouldn’t (over) deliver excellent products with absolute passion. But if people “know” you – through your story – then you can be human, too. And emotionally connected customers are more valuable – on a long term basis – than those who are satisfied with your product, but don’t care about you. Stories can help your audience find common touchpoint – reasons to engage with you. Excuses to reach out without feeling weird about it. If and when they meet you in person, the ice will already have been broken. 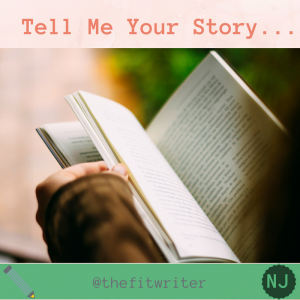 In my next post, I’d like to tell you about the most useful types of stories for fitness businesses to use.